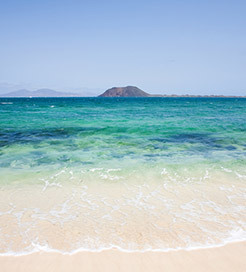 Just off the Canary Island of Fuerteventura’s north coast lies the serene islet, Lobos. The name translates to ‘Wolves Island’, deriving from the large number of monk seals, then known as ‘sea wolves’, which were found on the island when it was discovered by the Spanish in the 15th Century. It was made a nature reserve in 1982 due to its large number of wildlife and plants and is therefore a great destination for birdwatchers. It is home to a mix of species including the Shearwater Cinderella, Bulwer’s Petrel and the yellow-legged gull. On the ground, there are colourful plants such as Sea Uvilla and White Caleton, and in the water there are barracudas, bream and striped fish. You can stroll around the 14km coastline in just a few hours, with lovely views of Lanzarote to the north and Fuerteventura to the south. As it is a nature reserve, you must follow the designated paths and take care not to litter. There is little shade on the island so bring plenty water and wear sun protection. You can also hike to the top of the 127m high Calder de la Montana for even better views. Or walk up a gentle hill to the Punta Martiño lighthouse in the northeast. It was opened in 1865, making it one of the oldest in the Canaries. After exploring the island’s volcanic landscape, spend the rest of your day relaxing on the Playa de la Concha. This peaceful, sandy beach boasts lagoon-style blue waters, making it the perfect place to refresh after a long hike. Lobos is just 2km from Fuerteventura, so it’s quick and easy to get there by ferry. There are frequent crossings every day from Corralejo in northeast Fuerteventura, which arrive at the southern coast of Lobos, lasting around 15 minutes. For more information, please visit our Ferries from Fuerteventura to Lobos Island page.